In Sacramento a Beethoven Festival has been created from a spectacularly disastrous concert in Vienna in 1808 where everything was composed and performed by Beethoven. It was intended to be a benefit for Beethoven, but everything seems to have gone wrong. For one thing it was freezing cold inside the venue. It was Beethoven's final public appearance as a soloist because he was obviously going deaf. Concerts that lasted 4 hours were not uncommon in Beethoven's time, but we are not so enduring and have divided it into two concerts. It is important to remember that at this time Berlioz had not yet invented standing in front of an orchestra and waving a stick. Beethoven would probably have sat at the piano the entire time. 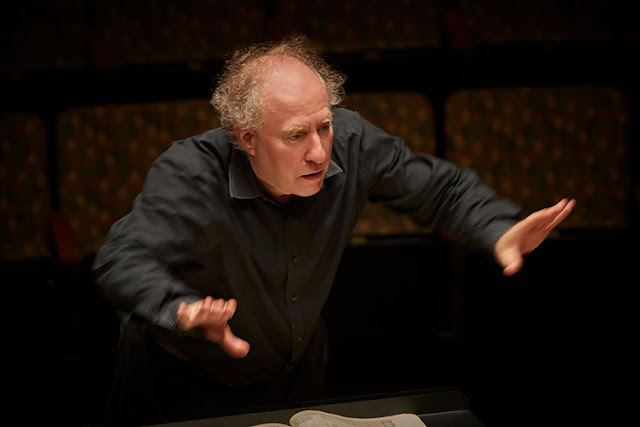 Our series of two concerts are created around conductor/pianist Jeffrey Kahane. People who conduct and play as soloists at the same time are regularly seen at the Sacramento Philharmonic. This works better than you would think. Kahane, our conductor/pianist, was a definite hit in this piece and handled both his tasks well. After the concerto, he played an extemporized solo version of "America the Beautiful." She was fine in this piece, but I couldn't help thinking her Italian diction could have been better. This is a program symphony, which means there is an associated story. Heiligenstadt, a town up the Danube from Vienna, was a favorite place for Beethoven to compose, and the story is sort of an homage to this place. The ensemble became a bit ragged toward the end. The Choral Fantasy is a one of a kind piece. It starts off like a piano sonata, then is joined by the orchestra for a while. Just about when you are wondering why there is a chorus on the stage, a group of soloists join the group as a small ensemble. Finally the chorus also sings to end in an impressive finale. I can't think of anything like it. This is a fun piece with nice work for the piano. It was enjoyably performed, unlike Beethoven's rendition. This is not the most fascinating mass, but all performed well. This concert was sold out, a first for the Sacramento Philharmonic and Opera. The presence of Beethoven's Fifth undoubtedly provides the explanation. Believe it or not, it continues on after the famous 4 note theme. This was the highlight of the concert. It is an impressive piece, but you didn't need me to tell you that. Kahane stood on the podium for this. I enjoyed his work. He forcefully prevented the audience from applauding between movements. Performing this two concert series was a kind of musicological experiment in discovering performance practices in Beethoven's time. The disasters found at Beethoven's original concert were entirely avoided. Kahane is a marvelous conductor and pianist. Had the pleasure to see him conduct the Colorado Symphony a few years back, where he was also the soloist for Gershwin's "Concerto in F."